Could Solar Alone Entirely Replace Fossil Fuels? If we were able to capture 100% of the sunlight the earth gets each day, would that be enough solar power to replace the fossil fuels that the world uses in that day? The answer is yes, according to experts at NREL. That would be far more than enough. As of 2012, the entire world used 17.7 terawatts for the year. About 10,000 times that much sunlight fell on the earth in that year; 170,000 terawatts. So, yes, it is actually much more than possible, because ten thousand times as much sunlight falls on the earth as we would need to do it. Put another way, we only need to capture 1 ten-thousandth of the sunlight hitting earth to entirely power the world with solar power. Many studies have shown that a relatively small patch of the Sahara desert, for example, could power the entire world. Of course, then there would need to be long transmission cables to the rest of the world, and practical considerations. So in practice large solar plants are simply being built closer to cities around the world, or lots of small solar arrays right on each rooftop. But, how can solar provide power at night? At the individual rooftop level, batteries make it possible to store the solar energy from PV, for use after dark. Solar PV, the panels you put on a roof, absorbs only the light frequencies, and can turn this part of the spectrum into electricity instantly and directly to supply daytime solar needs. A different kind of solar power absorbs solar energy just from the heat spectrum in that same sunlight falling on earth. Solar thermal electric (STE) power plants boil a liquid using that heat, to run a steam turbine to generate electricity. This liquid, usually molten salt, can be stored in gigantic tanks for up to two months without losing heat. This cheap thermal energy storage can then be sent back and run through the power block to make electricity whenever called upon. Co-located solar plants of these two types can absorb different parts of the spectrum of sunlight, and use part of the sunlight for electricity in the day, and a different part of the spectrum; heat, for power after dark. Combining these two forms of solar energy capture, one taking the light and the other taking the heat, both days and nights can be supplied with solar energy, because with very cheap thermal energy storage, solar power becomes completely dispatchable, that is, it can be sent to the grid on demand. 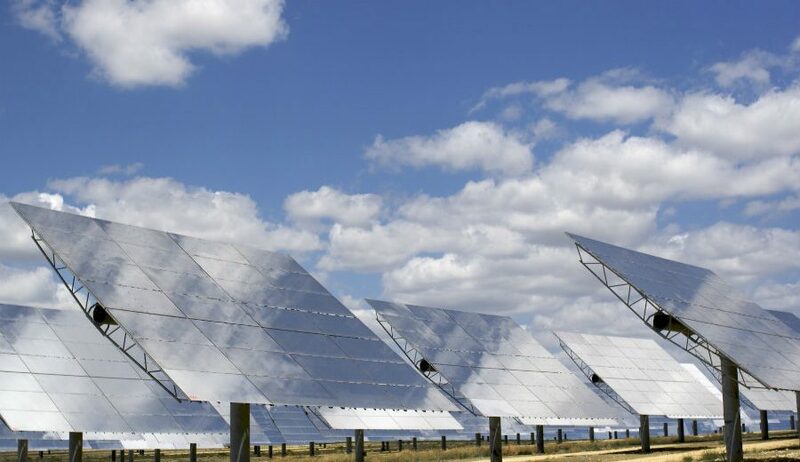 Some solar plants are already being built that combine these two kinds of solar, both PV, and CSP – or concentrated solar power, as this is sometimes called. In Chile, where fossil fuels are more expensive than solar, a combined PV/CSP plant is being built that will run 24 hours a day. A small battery remains solar-PV charged also, because the solar steam-powered turbines take about half an hour to get to full power. Once solar supplies all the global electricity needs, then switching from driving a heavy combustion engine to driving a simple electric motor completes the transition for both individual vehicles but also buses and high-speed trains, all run on solar electricity. So, yes, solar alone could replace fossil fuels. In practice, wind makes more economic sense than solar in some cloudy, windy regions, so the world is rapidly growing both renewables.